As the eldest daughter of the duke of Braunschweig, a granddaughter of Frederik II, and a cousin of Christian IV (these latter two both kings of Denmark), Sophia was raised at the ducal court in Wolfenbüttel. In 1607 she married count Ernst Casimir (1573–1632) who was eighteen years her senior and who had just inherited the county of Nassau-Dietz from his father Johan, a brother of William the Silent. When in 1620 Ernst Casimir succeeded his brother Willem Lodewijk as stadtholder of Friesland (including the provinces of Drenthe and Groningen), Sophia and her husband settled with their family at the Nassauhof in Leeuwarden. Of her nine children, only two sons — Hendrik Casimir (1612–1640) and Willem Frederik (1613–1664) — reached maturity. With Ernst Casimir engaged in military conflict for much of his rule, Sophia Hedwig assumed responsibility for their children’s education. It was through Sophia Hedwig that the Frisian court received a more prominent and international status. Following the death of her husband in 1632, and again after the death of her son Hendrik Casimir in 1640, Sophia Hedwig accepted regency over the family estates. 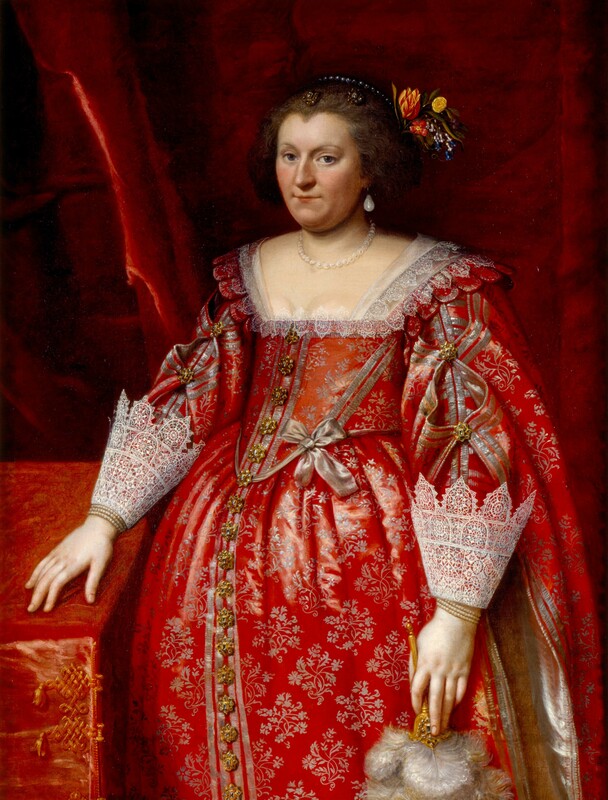 During the Thirty Years’ War she displayed impressive managerial qualities in addition to significant diplomatic skills. She organized personally the armament of the local population, and she offered food and safe haven at Nassau Castle. As an expression of their gratitude for her services, her sons signed a declaration in 1634 in which they handed over to their mother formal government powers for the county of Nassau-Dietz. As a result of the marriage of her son Willem Frederik to Albertine van Oranje-Nassau, Sophia Hedwig may be considered the matriarch of the current Orange-Nassau dynasty, the members of the present Dutch royal family of the Netherlands being the direct descendants of this union. The metadata for this catalogue in EMLO was provided by the Huygens ING under the direction of researcher Dr Ineke Huysman. 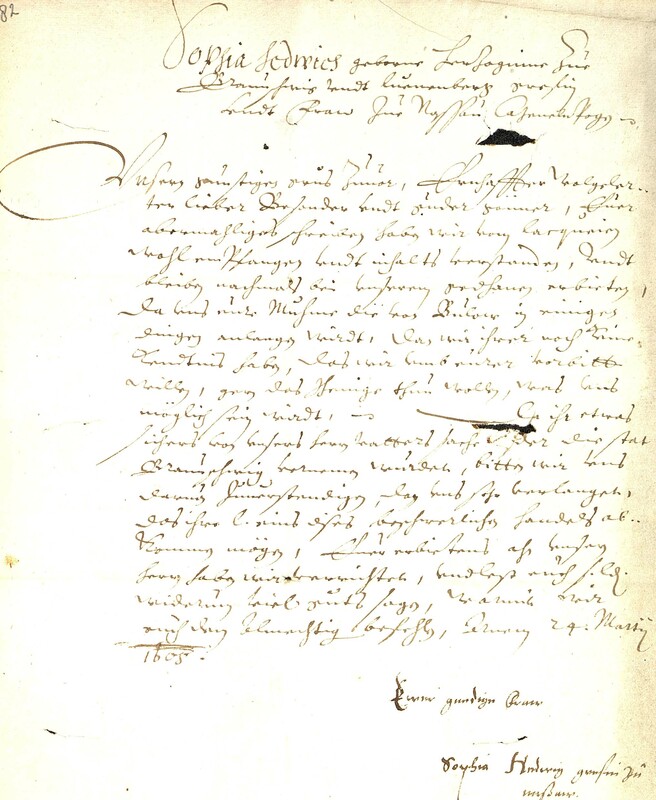 Huygens ING has digitized the documents in cooperation with the Royal Collections The Netherlands in The Hague, where most of the original letters are conserved (Archief Sophia Hedwig van Brunswijk-Wolfenbüttel, A23a). In the near future, further letters both from and to Sophia Hedwig, which are conserved at Tresoar in Leeuwarden, will be added in collaboration with the Fryske Akademy. This calendar has been prepared for publication as a part of a collaboration with EMLO and the associated Women’s Early Modern Letters Online [WEMLO] resource. Thanks are due to Professor James Daybell and Dr Kim McLean-Fiander, and to Dr Nadine Akkerman. Cultures of Knowledge would like to thank EMLO Digital Fellows Charlotte Marique and Callum Seddon for their help to prepare the metadata for upload. Currently the catalogue contains metadata of 169 letters now in the care of the Royal Collections in The Hague. The letters were written in German, French, and Dutch, and they date from 1605 to 1640. Sophia Hedwig was the author of thirty-nine of these letters while the remaining 130 are addressed to her. Each letter record in the EMLO union catalogue provides a link to a digitized copy of the original document and in the near future further letters both to and from Sophia Hedwig, mainly conserved at Tresoar in Leeuwarden, will be added. W, Bergsma, ed., ‘Het hof van de Friese Nassaus (1584–1747)’, It Beaken, 60, no. 3/4 (1998). M. Bruggeman and A.P. v an Nienes, eds, Archieven van de Friese stadhouders. Inventarissen van de archieven van de Friese stadhouders van Willem Lodewijk tot en met Willem V, 1584–1795 (Hilversum, 2002). S. Groenveld, ‘Nassau contra Oranje in de 17e eeuwse Republiek’, Jaarboek Oranje-Nassau Museum (1997), pp. 10–53. S. Groenveld, ed., Nassau uit de schaduw van Oranje (Franeker, 2003). R. Heck, Die Regentschaft der Grafin Sophie Hedwig von Nassau-Dietz 1632–1642 (Dietz, 1923). M. Klatter, ‘Een vergeten stammoeder van de Oranjes. Sophia Hedwig, gravin van Nassau-Dietz’, in E. Kloek, ed., Markante vrouwen, themanummer Spiegel Historiael, 40, no. 7/8 (2005). L. Kooijmans, Liefde in opdracht. Het hofleven van Willem Frederik van Nassau (Amsterdam, 2000). J. J. Poelhekke, Frederik Hendrik prins van Oranje. Een biografisch drieluik (Zutphen, 1978). J. Steur, ‘Sophie Hedwig. Hertogin van Brunswijk-Luneburg, 1592–1642’, in E. van Beusekom, et al., eds, Moeders uit ons vorstenhuis (Amsterdam, 1938), pp. 99–118. J. Visser, Gloria Parendi, Dagboeken van Willem Frederik, stadhouder van Friesland, Groningen en Drenthe, 1643–1649, 1651–1654 (Den Haag, 1995). For additional biographical information, see the page at the Huygens ING and the entry in Wikipedia. The Wives of the Stadtholders: an exhibition (September 2016). Please see our citation guidelines for instructions on how to cite this catalogue.